WORCESTER – Peter Granger, known to friends as Scoop, longtime proprietor of Oneonta’s Copper Fox Tavern, peacefully passed away at the age of 83 on April 14, 2019. 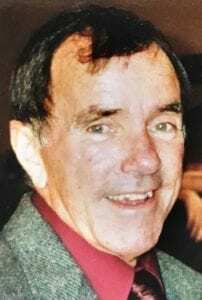 He was born on Dec. 25, 1935, in Glens Falls to Earle and Lutheria Granger. He graduated from St. Mary’s Academy in Glens Falls and attended Cobleskill Agriculture & Technology College, graduating with an associate’s degree in Animal Husbandry. Following his graduation, he enlisted in the Marines, he was proud of his service and celebrated the Marines’ birthday yearly. Peter was well known in the Oneonta area as a bar owner, softball pitcher and a friend to anyone in need. He owned the Copper Fox Tavern for 20 years and he proudly sponsored dozens of events at the venue for various charities, fundraisers and promotions for college fraternal organizations. Peter was predeceased by his parents and his devoted wife, Margorie Granger. He is survived by his daughter, Carrie Brown and fiancé John Mullin and two grandchildren, Hayley and Logan. Three sisters, Gloria Granger Mann, Mary Granger Ponting and Catherine Granger Welcyng. Also, his step-children, Wayne Sabia and his son, Dylan Sabia, as well as Tim and Melissa Sabia with their two children, Bailey and Tyler. He is also survived by many loving nieces and nephews. Calling hours are 2-4 p.m. with Military Honors at 4 p.m. Saturday, April 20, at the Heller & Skinner Funeral Home, 155 Main St., Worcester. In lieu of flowers, a donation can be made to the Worcester Food Bank, 178 Main St., Worcester, NY 12197. Great guy had many enjoyable experiences with him. Copper Fox had to stand outside for 1/2 to get in .Pete will miss you. Lots of great times at the Copper Fox during my college years at SUCO. Many sorority functions and Friday night Sour Hours. Peter was the quintessential bar owner and always made you feel welcome within those walls. We will miss you and raise a toast to you at our next reunion Peter. Pete was a great guy I learned a lot from him over the years before we bought the fox from him. He will be missed by all who knew him, and those who benefited from his giving and good nature over the years.